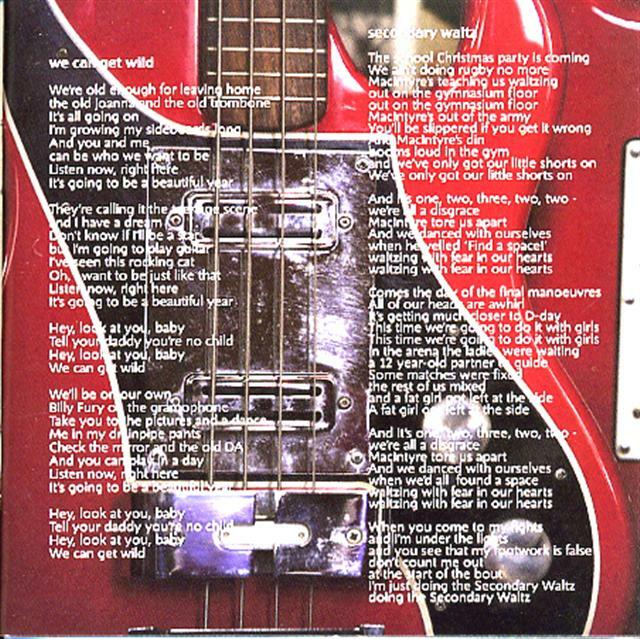 What a surprise to find a Rapier Bass featured in the sleeve notes for Mark Knopfler's album "Kill To Get Crimson"
Remember you saw him here first when Jimmy is famous! Watkins Rapier goes Punk ! "Here are a couple of pics of the"Fruit Eating Bears" Rapier serial no 1777. One was taken for the 1998 compilation CD. 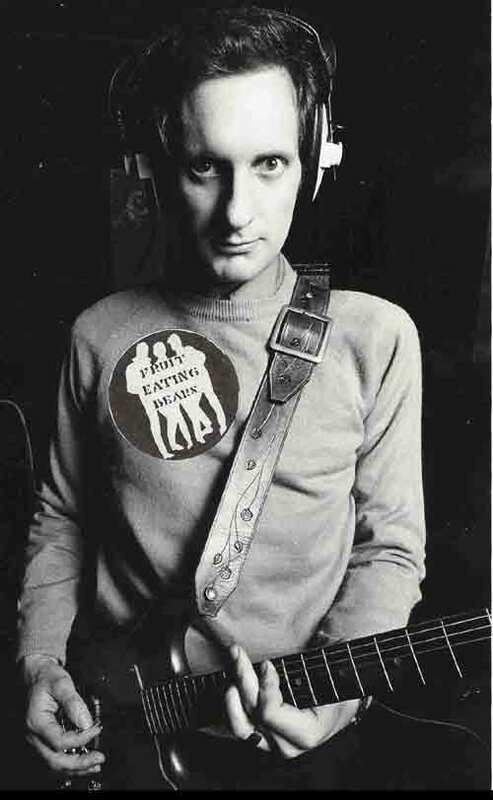 The other was taken in 1978 at Jackson studios Rickmansworth whilst recording tracks for the said album. 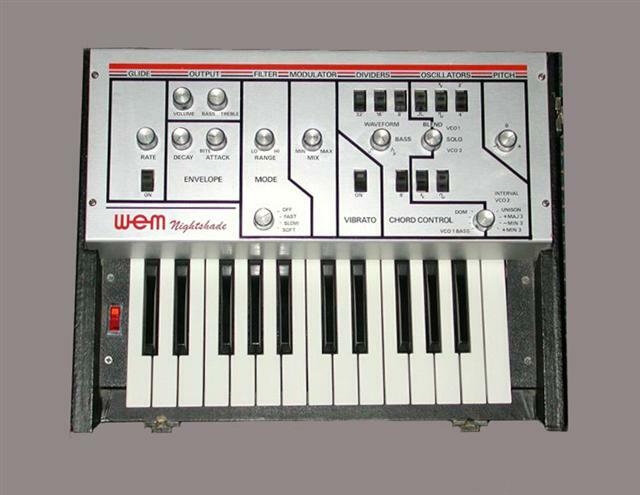 It was used for the solos and overdubs on "Flirt in a Skirt" "Shop Door Squeeze" and "Indian Giver" because I needed to use a tremolo on them. 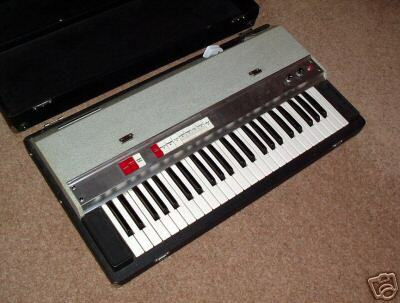 I used it all the time on gigs as a back up guitar, when strings went on the telecaster, the most notable occasion being the Chelmsford Rock punk festival when John Peel took photos of me playing it with blood dripping from my fingers. I mean the action's not that bad! He says he still has the photo, but can't find it. 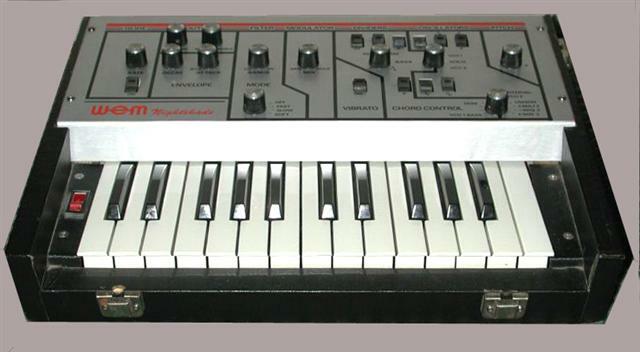 Anyway the Rapier still looks the same today, 25 years on." Geoff had some illustrious company at the Liverpool Institute. Paul McCartney was in the same year and George Harrison a year below. 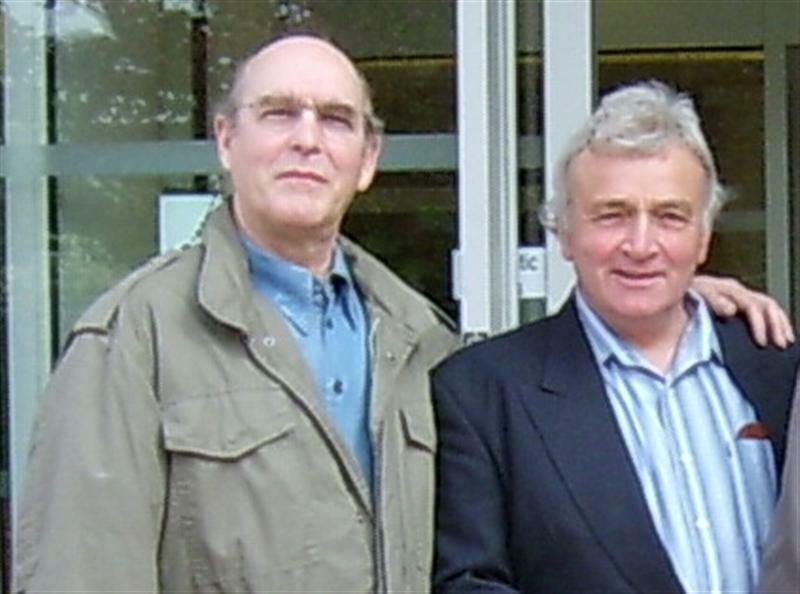 10th July 2009 - Today I received the sad news that Geoff died yesterday. It's hard to imagine that I will never get another e-mail from Geoff. We had been in regular contact since 2003 and had met a number of times. 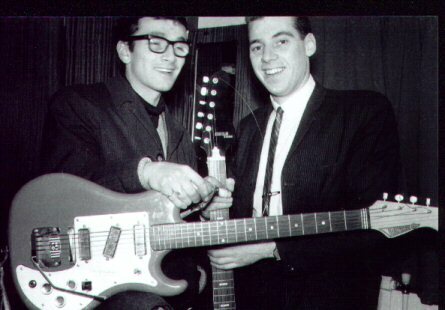 Of course we shared an interest in Watkins guitars and amps and exchanged spares whenever possible but Geoff had wider musical interests and was extremely knowledgable about all makes of guitars. 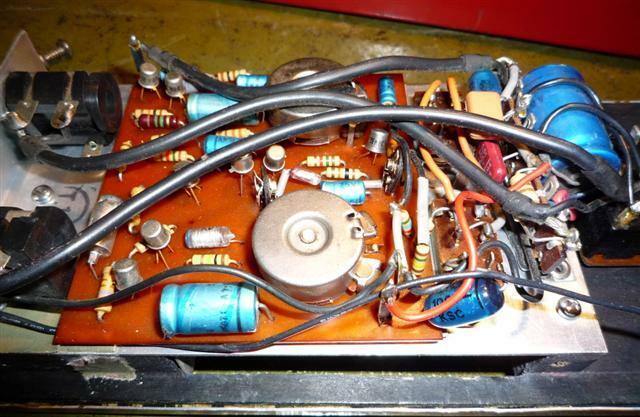 Latterly with the help of Mike Crittenden he learnt to build and repair valve amps. 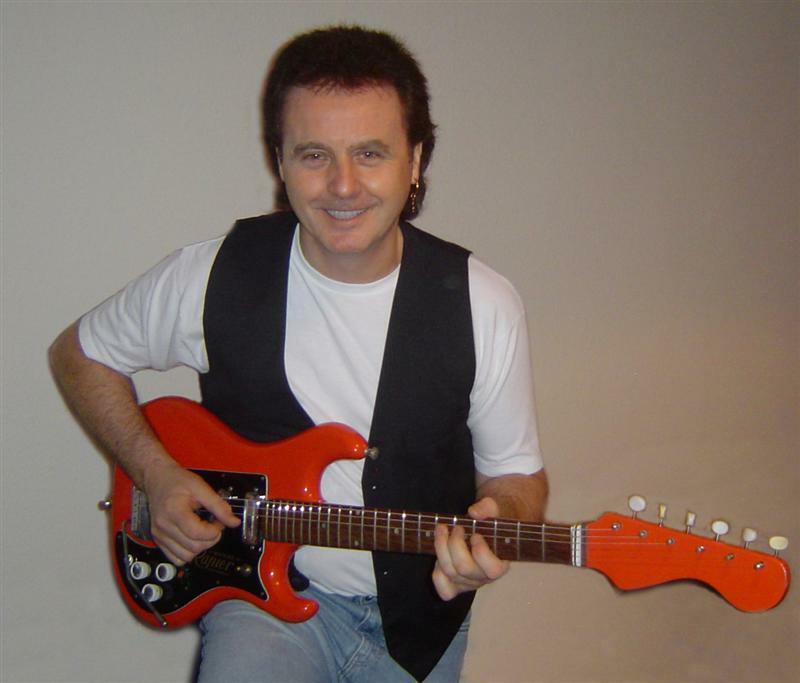 In his younger days, Geoff had great success playing country and western on the club circuit, with his stage name of Jim Bodene. He was extremely proud of his Liverpool roots where he had a number of Beatle connections through his contemporaries at the Liverpool Institute. There wasn't much he didn't know about the Beatles and he was great friends with Neil Aspinall, The Beatles business manager. Geoff was one of a diminishing number of true gentlemen - people with principles and complete integrity who would never let you down. I greatly valued his friendship and will truly miss his wisdom and love of life. My sympathy goes out to his devoted wife Freda and his two grown up daughters, Julie and Karen. 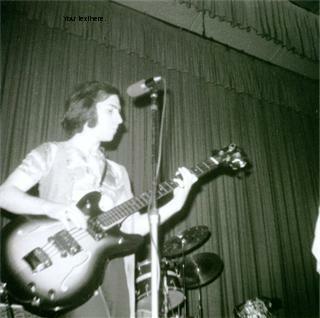 Manuel Capurro played this Wilson semi Acoustic bass in his band Ablegem. 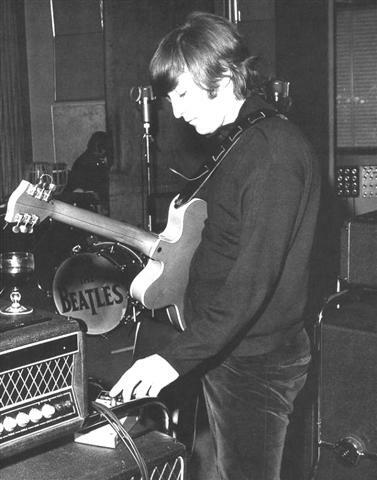 This picture was taken around 1970 in Hammersmith Town Hall. 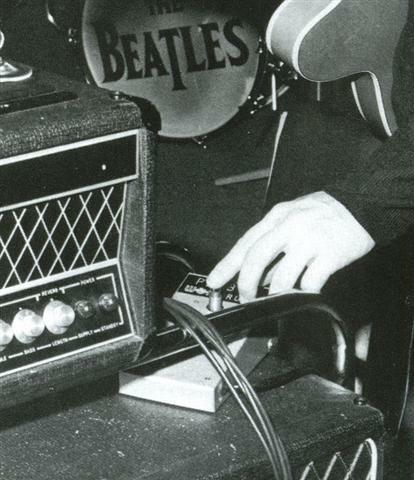 The bass had a very nasty accident when it was dropped by airport baggage handlers but after repair Manuel traded it in for a Fender Mustang. In memory of Manuel who sadly died 2008. 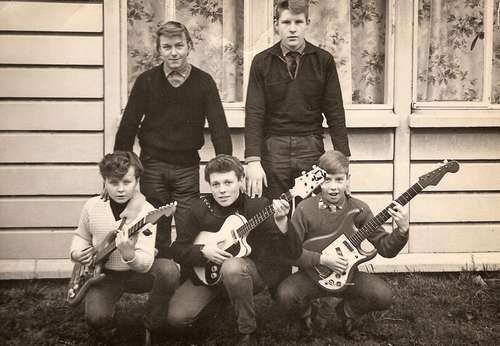 "Count Boris and the Backbeats"
"Paul Ferris and the Firebrands"
"The Rapiers" don't play Rapiers! 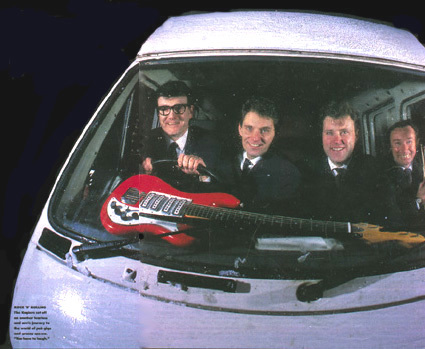 But they play great 'Shadows-type' music and the lead guitarist is a Hank Marvin doppelganger. Check them out live or on CD if you get a chance. 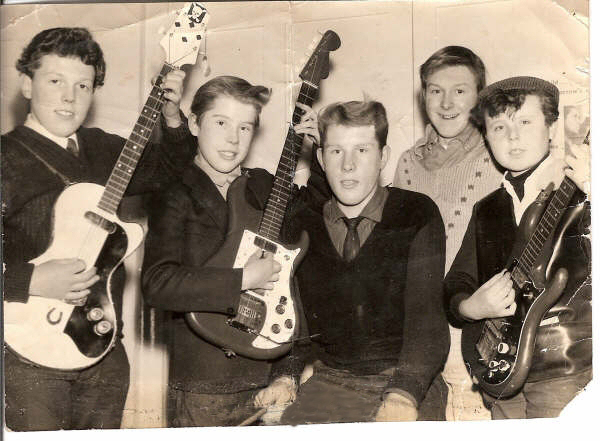 I remember going on a 107A bus from Enfield Highway to "Berry's" music shop in Tottenham High street to purchase this magnificent guitar on my 12th birthday in 1960 . The trip on the bus took about an hour with a change. 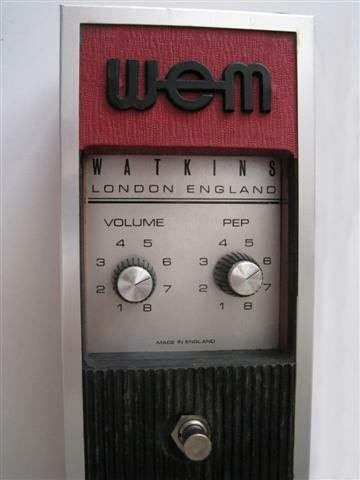 How proud, I walked, in Ponders End on the change between buses, returning home with my Watkins in its box. I must have stood at least 12ft tall on that day. It still plays well after all these years. I have since moved on to Fenders but I will never part with it. It is part of my life and part of me. It was been gigged vigorously during the 60's and unfortunately the lacquer finish has checked. Too many hot gigs and cold nights in the van in thosedays. - If I only knew then what I know now!!!!. 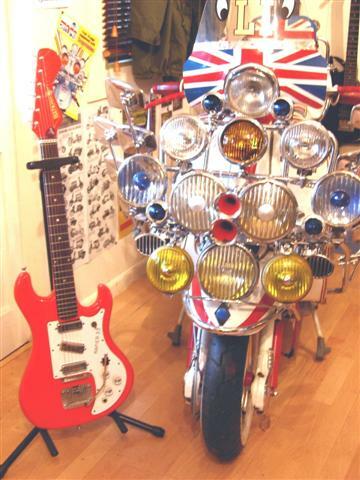 It has 2 gold type adhesive letters on the top horn which are my initials - Inspired when I saw Hank Marvin with his initials on his red Fender during the 60's I was contemplating having the guitar re-lacquered many years ago, but I was told to leave it as manufactured as it would devalue it !!!!!! Any way onto the guitar. It was purchased in April 1960 Serial number 1731 - looks as if it was stamped into the wood by hand as the number 3 isnot as indented as the other numbers. Place of Purchase : Berry's Musical Shop -Tottenham in North London Still has its original Tremolo arm, push fit The back of the neck is a faded red to natural and back again at both. I had an ER 40, bought with a 2 x 12 WEM bass cabinet from a 2nd hand shop in Bishop Auckland for about twenty quid. What struck me was the speaker connection was hard wired from the amp. 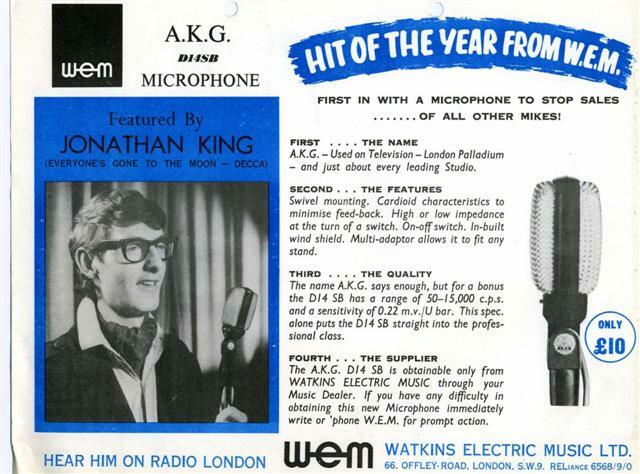 My mate Paul's more modern ER40 had a jack socket speaker output, while mine was a four foot lead with a white plastic plug on the end. 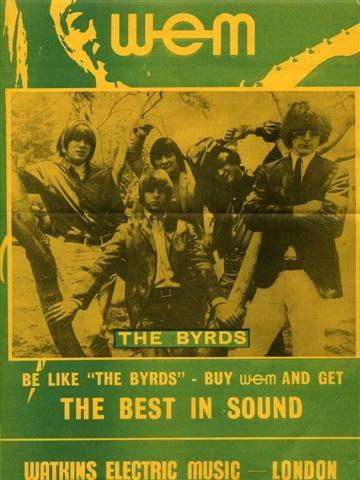 This was about 1968/69 . Later on we bought a Starfinder 4x12 for thirty quid and we used this as a PA cabinet to match (?) the single 4x12 WEM column on the other side. 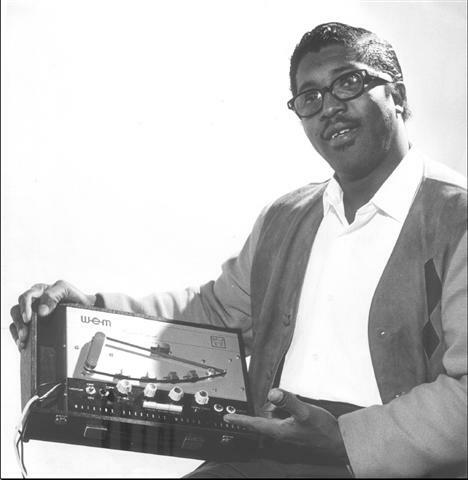 The PA amp was a croc skin Selmer TB50 and there was a tape Copicat for reverb. Paul made his own tape loops to save money. 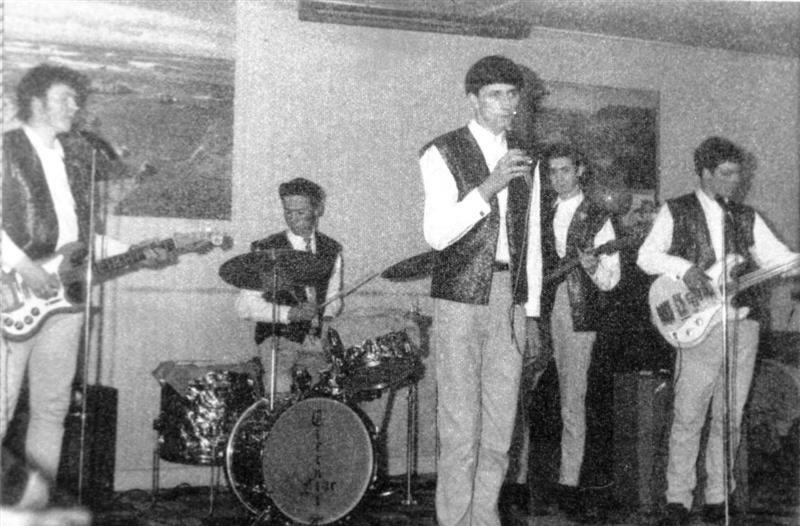 The band was named "Lame Gypsy" and consisted of Paul Ainsworth (then a grand old age of 19) on lead and vocals; Graeme Park (me , at 15) on bass and Don Ashton, (also 15) on drums. 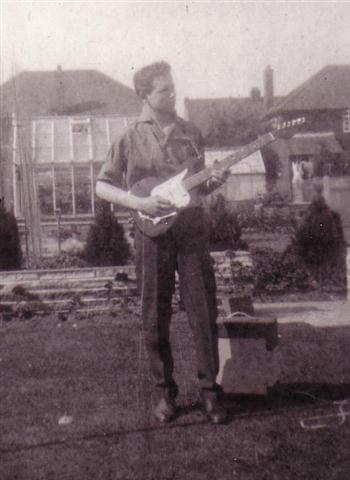 Paul had a Gibson Les Paul Custom - cost him 600 quid (rich grandma). 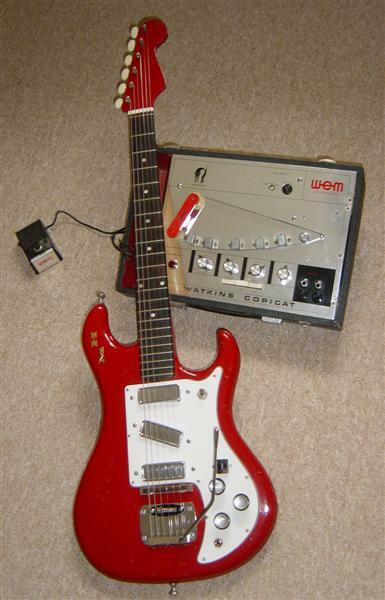 I remember the could get all sorts of sounds out of his ER40 - no delay, reverb or overdrive - just pure rock tone. 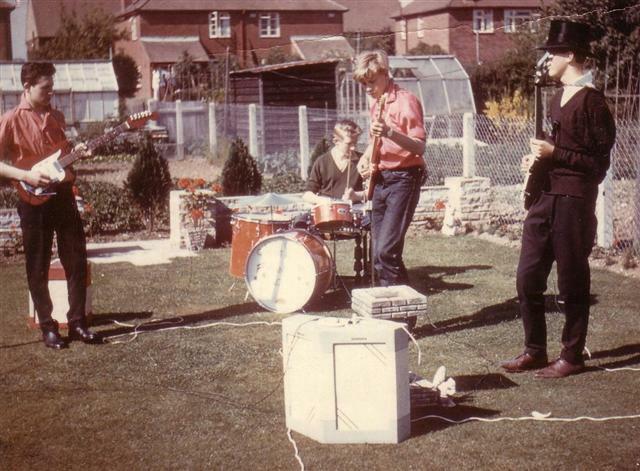 We played Cream and Hendrix covers, blues and rock and roll and we played at Working Men's Clubs all over the North East of England. I later bought a Shaftesbury Les Paul Custom copy, which I still have. Paul got bored with us (we wuz only kids) and split, leaving us with a full gig book and no guitarist. We divided the gear up - he took the 4x12 and gave me his 2x12 in payment. What Paul didn't know was that the night before he came to pick up his Starfinder, I had accidentally swapped its 4 Celestion G12s with the four Fanes from the 2 x 12 cabinets and in doing so managed to accidentally (yer honour) put a screwdriver through one cone. It was only a little hole. And it was an accident , I'm not that vindictive. 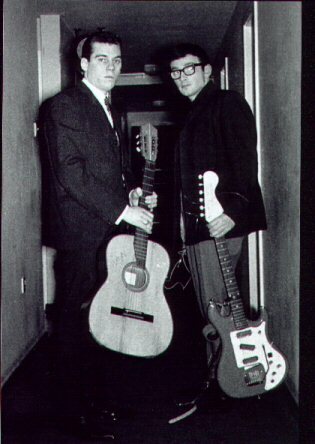 I went back to lead guitar and Pete Flint came in on bass and vocals. 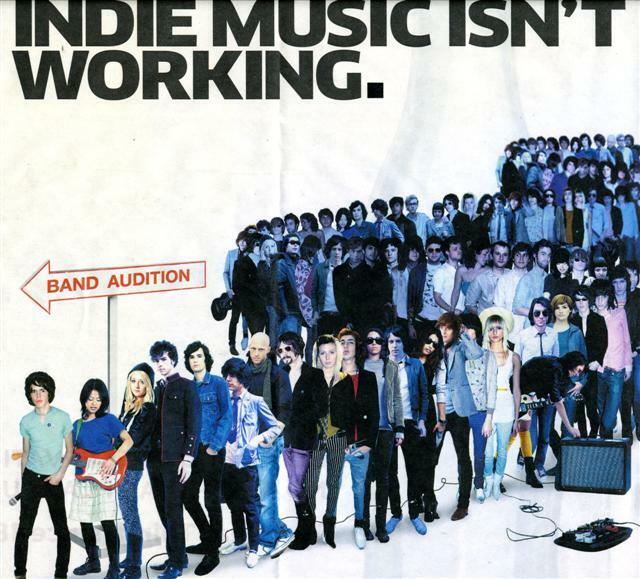 We did an audition (along with another 20 or so bands) for Mickey Most at the Theatre Royal Drury Lane in 1972 - thanks boys - get off ! - next! Don had the honour of standing next to Mr Most in the Gent's and splashing his shoes with a "careless" movement. 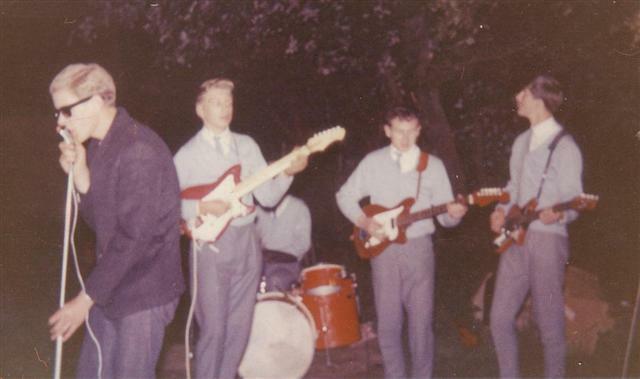 I saw Paul again about a year later when his band Amoeba came through my home town. He said he'd sold the Starfinder as it started sounding crap. Oops. The sellotape I'd put over the hole must have come off. I kept my ER40 for a few years more before putting it in part exchange for a SIMMS WATTS 100 watt valve amp and cabinet from Bells Music in Newton Aycliffe. This was the northern offshoot of Bell's Surbiton shop and a veritable oasis of music. 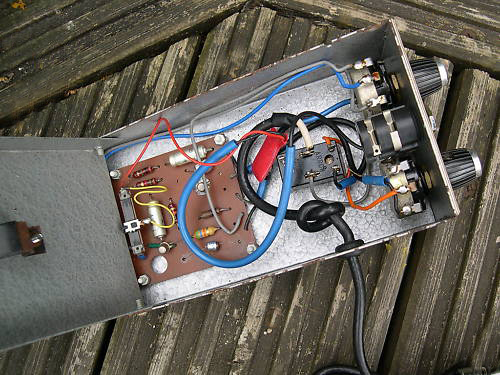 I had to use a fuzz box with the Simms as I couldn't wind it up enough to overdrive. The Simms was good, but not a patch on the WEM. 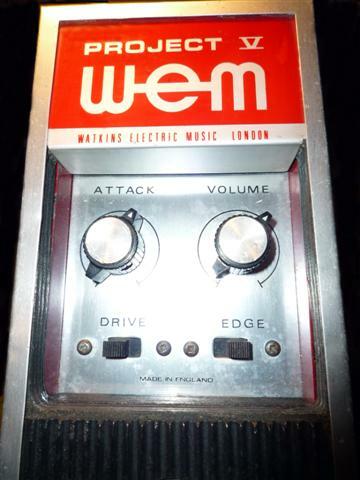 I wish I'd been able to afford to keep the WEM gear though - as a "plug it in and switch in on" type of amp it was unbeatable. 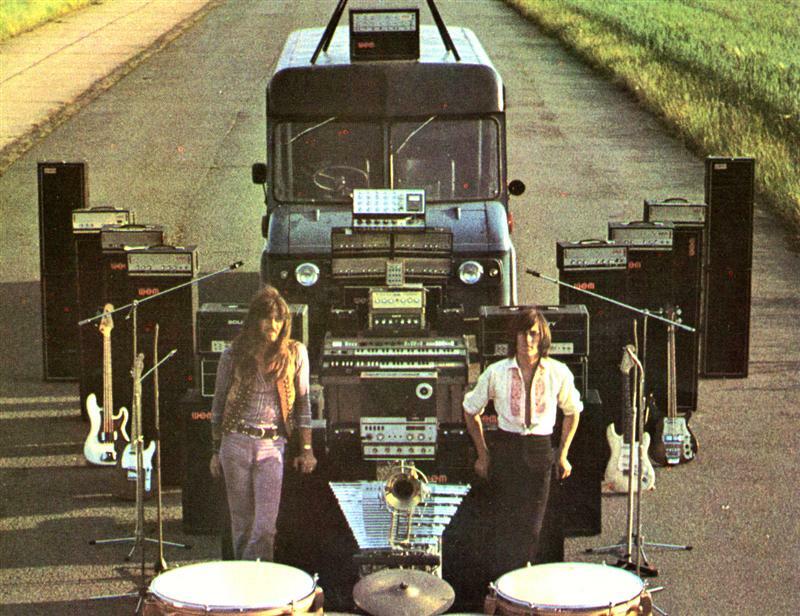 The amp top and two 2x12 cabs set up in a kind of mini stack had cute appeal and it was a third of the weight of that ruddy ten ton Simms Watts monster. I left "Lame Gypsy" and joined "Merlin" in 1972, leaving as year later when my career took a turn and I went to sea in the Merchant Navy. The drummer from Merlin (Mick Goodings) joined White Spirit with guitarist Janick Gers, who then was poached by Iain Gillan, then by Iron Maiden. So in a way, I have a distant connection with Rock Royalty. 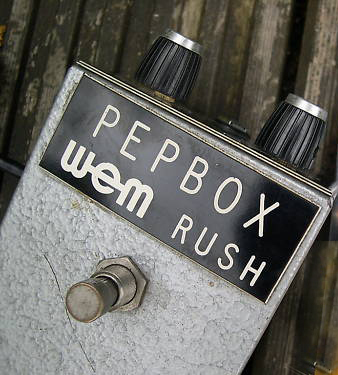 Now I live and work in Dubai and my band mate Pete Holyoak has a WEM PA40 that he bought new in the 70's and has kept in good nick ever since. 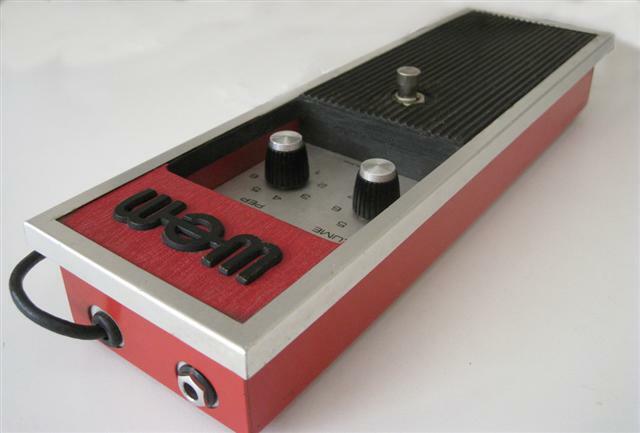 That black red and silver box with the ultra cool WEM logo still looks a damn good piece of amplifier. We don't use it though as everything goes through the 1000 watt stereo PA now. That's technology for you. 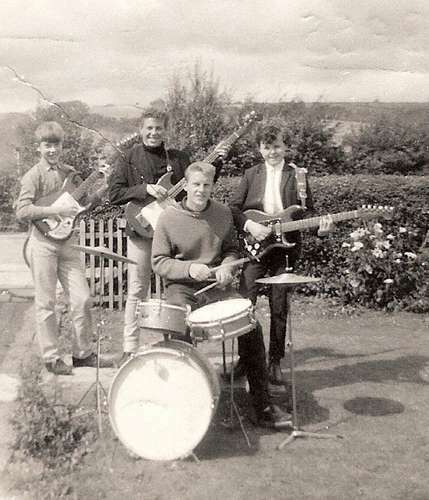 As a kid the band got paid thirty quid for a night - now we get three hundred. That's inflation for you. 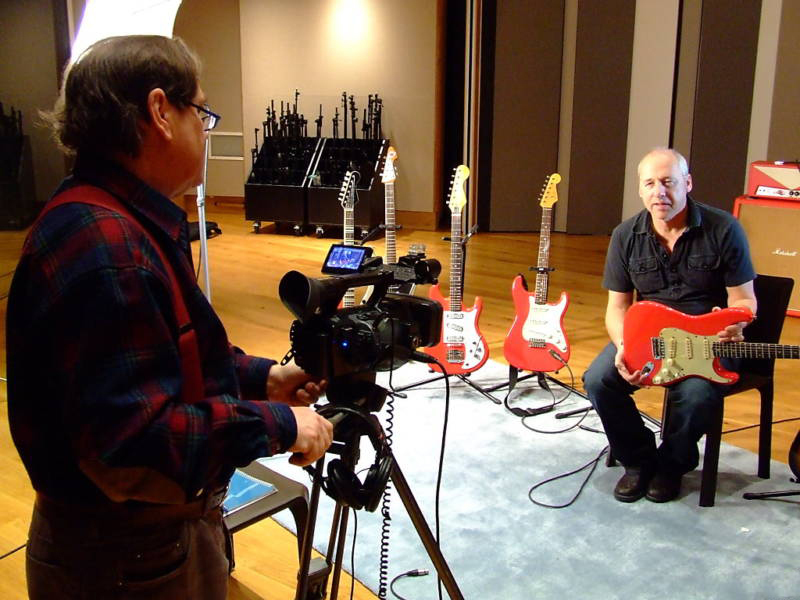 I still wish I'd never sold that ER 40 rig though. 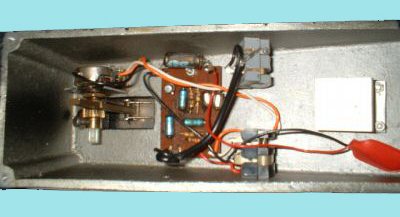 This mid 60s two transistor Fuzz Box was designed by Pepe Rush an Italian electronics engineer. 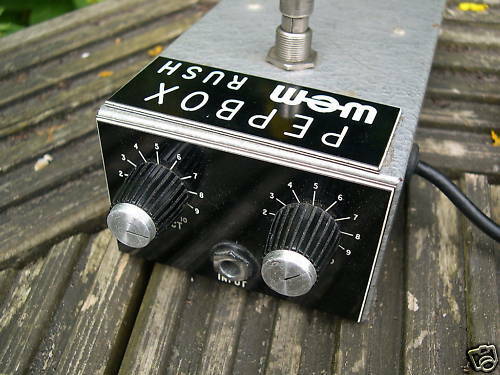 I'm indebted to fuzz sound expert Graham Green for the pictures of his Rush Pep and the Project V fuzz boxes below. 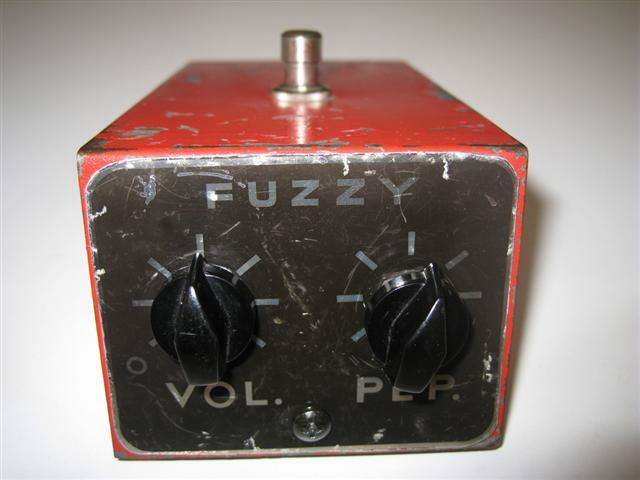 Graham also owns an interesting prototype called Fuzzy which probably evolved into the Rush Pep. 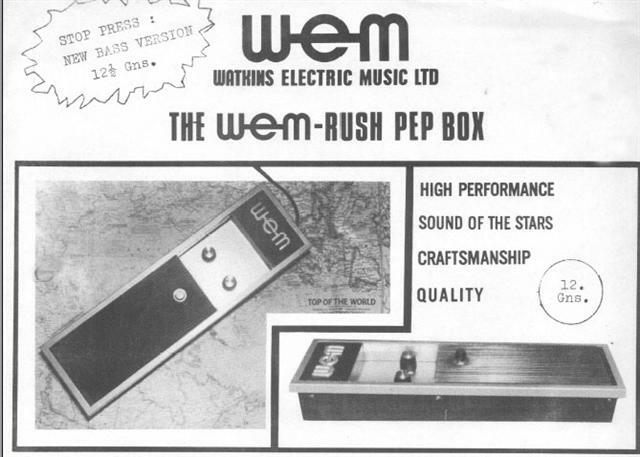 Below is the Project V similarly cased to the Rush Pep but a whole world away in terms of electronic sophistication. 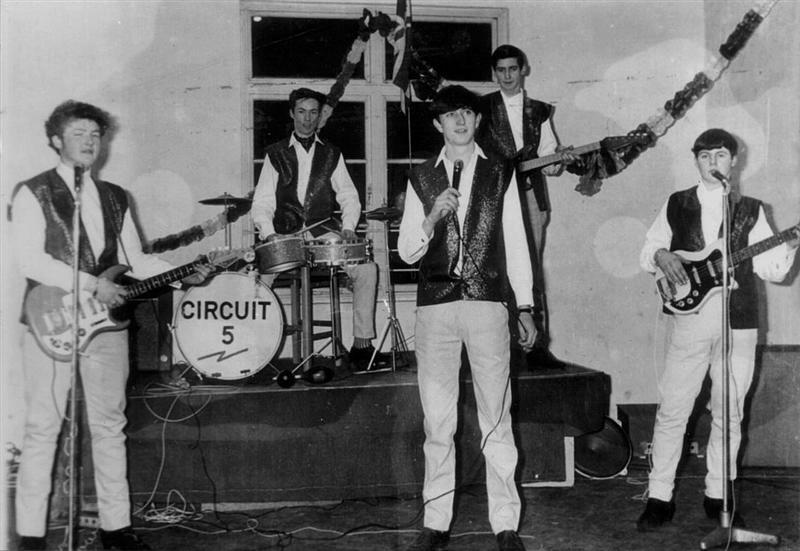 This 8-transistor circuit was probably a spin off from the Project IV guitar (See Solid Guitars page). 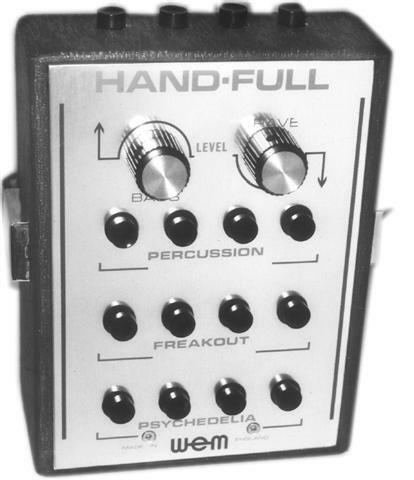 Graham Green reckons that it is one of the best fuzz boxes he has ever heard and he has heard and used them all . Anyone remember freaking-out or getting a Hand-full?!! If so, please keep it to yourself. 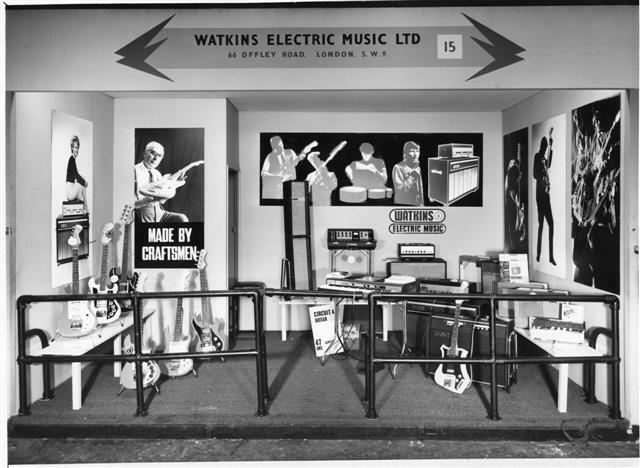 In this heavily fortified trade stand you can just make out some Circuit 4 guitars on the left and the ill-fated Fifth Man guitar/organ on the right .